Could someone explain to me why building a 13-story mosque in New York City, next to Ground Zero, is a good idea? The builders claim it shows Moslem sympathy for the victims of 9-11, and apparently the city government agrees with them, but to the rest of us it will be another symbol of Islam triumphing over Western civilization. First we had a crescent of trees going up in Pennsylvania, as a memorial to Flight 93, and now this. What next, a minaret added to the Pentagon? For my first witness, here’s Pat Condell, a British skeptic who gets it dead right where the Islamic menace is concerned. I posted videos from him before (on March 1, 2008), and here is his point of view on the mosque. As previously, his words on the matter are better than mine. And long-time readers may remember when I pointed out that Islam is NOT a religion of peace, contrary to what Presidents Bush and Obama said to us. See my messages from February 19, 2007 and May 17, 2007, to refresh your memory on that. Now Anjem Choudary, a radical cleric in Britain, has openly told a CBN reporter that Islam is not peaceful. Somebody needs to tell American liberals that the group they are trying to make peace with is anti-abortion, anti-gay, anti-feminist, anti-environment, and follows a religion that predates Karl Marx. It seems to me that goes against everything the Left holds dear. Now that the truth is out, let’s hope it’s not too late to save the West. Anyone who continues to ignore the threat after this point is being mentally dishonest. Look At the Size of That Arrowhead! A bit of archaeological news from my (current) home state. This enormous prehistoric Clovis point was just found in western Kentucky. Are they sure it’s not really a spear point? Anyway, you can read all about it in the link below. One reason why many people do not believe the Exodus account is because in many parts of the Old Testament, the numbers given are absurdly high. A good example is 1 Samuel 6:19, which says that God struck 50,070 people dead, because they looked into the Ark of the Covenant. Would you believe a modern news story with numbers like that, say, a report of a train wreck that killed 50,070 people? That doesn’t happen even in Third World countries with lax safety standards. But throughout history, Jewish scribes have copied their scriptures with painstaking care, not allowing a single Hebrew letter to be changed if they can help it. Because numbers are spelled out in Hebrew, and not written with numerical symbols, it makes more sense to believe that the numbers got confused at some point, than to assume that somebody made them up. That seems to have happened in the case of 1 Samuel 6:19. All Israelite “cities” at this point were really only small towns; the largest communities in the Holy Land (e.g., Gaza, Megiddo) belonged to the Canaanites or the Philistines. Therefore the town where this incident took place, Beth-Shemesh, probably did not have anywhere near 50,070 people. However, there are some Hebrew texts that say only 70 people were killed, leaving out the fifty thousand; Josephus also puts the casualty count at 70. Apparently a textual error is to blame for 70 becoming 50,070. In cases where two scriptures describe the same event, like the parallel books of Kings and Chronicles, it becomes apparent that the copyists had trouble keeping track of numbers, though they usually got all the words right. For example, 2 Samuel 10:18 says “700 chariots,” while 1 Chronicles 19:18 says “7,000″; somebody got careless with zeroes there. Or a digit can be left out: 2 Kings 24:8 says that Jehoiachin became king at the age of 18, but 2 Chronicles 36:9 gives his age as 8. When the text is counting men, it can go haywire, due to two words that look the same when written in Hebrew. The first word, eleph, means “thousand,” but it can also mean “family,” “clan,” or “military unit.” The other word, alluph, can mean “chieftain,” “commander”–or a professional soldier. When you write the words without vowels, as is normally the case with Hebrew, both look like lp. The distinction of professional soldiers is important because it appears that sometimes, when counting soldiers, the scribes kept track of how many were full-time and how many were recruited just for that campaign. To an ancient general, scribe or accountant, that mattered; most ancient societies could not afford to keep a permanent standing army. Their armies were what we would call militias; every able-bodied man was expected to take up arms when his ruler called on him to do so, but when the crisis passed, he would return to whatever job he had in peacetime. The only men armed all the time were the police and guards, so the typical kingdom would be virtually defenseless if an enemy surprised it before it had time to mobilize. In a nutshell, full-time soldiers were better fighters, but they were also very expensive, and could be dangerous if they turned against their ruler, so most rulers tried to cut corners by relying on part-time soldiers as much as possible. Leonidas: Doesn’t it? [points to one of the soldiers of Daxos] You there, what is your profession? First Soldier: I am a potter… sir. Leonidas: [points to another soldier] And you, Arcadian, what is your profession? Leonidas: Sculptor. [turns to a third soldier] You? Leonidas: [turns back and shouts] SPARTANS! What is your profession? Leonidas: [turning to Daxos] You see, old friend? I brought more soldiers than you did. So how does all this apply to the story of Moses? Well, the Book of Numbers, true to its name, is full of numbers, and a lot of them are larger than you’d expect. Take the two censuses listed in the book. The first census, conducted early in the journey, gave a result of 603,550 men fit for military service, while the second, done thirty-eight years later, reported 601,730. Add to that women, children and the elderly, and the estimated size of the Israelite nation is 2 to 3 million. This is a stupendous population, equal to what Egypt had at the time, and the Nile Valley was a much more pleasant place to live than the desert. Put that many people in Israel, and the population would be equal to modern Israel’s population in the 1960s. How would you feed that many people, with the primitive farming techniques available back then? And remember that only seventy souls were listed in Jacob’s clan when he moved into Egypt. Whether you believe the Israelites were in Egypt for 215 years (the short chronology) or 430 years (the long chronology), they would have to grow from 70 to 600,000+ in a few generations. That would require that everyone be incredibly prolific; each couple would need to have at least as many kids as Jacob did. On the other hand, a scribal error may have confused the words eleph and alluph, as mentioned above, producing census totals that are at least an order of magnitude off. For example, if the tribe of Simeon was originally counted as having “2300 men, of which 57 are professional soldiers,” the census taker would have been thinking “2.3 eleph and 57 alluph,” but he would have written it down as “2.3 lp and 57 lp.” Later on somebody else would have tried to clean up the figures by adding all the lps, turning the result into 59.3 lp, and causing scholars later on to think that lp simply meant “one thousand,” so that the count for Simeon became 59,300 men. As for the Levites, who weren’t organized for military service, somebody may have thought their numbers were too small in comparison with the other tribes, so they assumed a census taker wrote down the wrong number for them, and added some zeroes to “correct” the problem. Break down all the census figures this way in the original Hebrew text, and it looks like there were really 18,000 men on the march, a much more manageable figure than 600,000+. Then if the families of the ex-slaves were about the same size as our families, we get a total of approximately 72,000 people for the whole Israelite nation. 1. We don’t know where most of the campsites were (see the next section). 2. They would have needed to camp in one spot for more than a few days, to leave anything that would get an archaeologist’s attention. Compare the Exodus with the Woodstock concert; where an estimated 450,000 converged on a farm in upstate New York for three days. Though everybody who was a young adult in 1969 now claims to have been there, if you go to the site of Woodstock today, you won’t find as much evidence of the event as you might think. The concert stage has been preserved, and you will see a museum and a monument that is jokingly called the “Tomb of the Unknown Hippie,” but those only exist because people want to remember the event. 3. Although everyone of the Exodus generation died in the wilderness, except for Joshua and Caleb, any graves the Israelites dug for them would have been simple affairs–if the dead were buried at all. They certainly wouldn’t have spent seventy days preparing a lavish burial and funeral, the way the Egyptians did. Even the graves of the three most important figures–Moses, Aaron and Miriam–have never been found. 4. The size of the campsites would have been a lot smaller, and there would have been far fewer graves, if the smaller numbers talked about in this section are correct. “The big oil spill in the Gulf of Mexico is bad enough in itself. But politics can make anything worse. Let’s stop and think. Either the government knows how to stop the oil spill or they don’t. If they know how to stop it, then why have they let thousands of barrels of oil per day keep gushing out, for weeks on end? All they have to do is tell BP to step aside, while the government comes in to do it right. If they don’t know, then what is all this political grandstanding about keeping their boot on the neck of BP, the Attorney General of the United States going down to the Gulf to threaten lawsuits — on what charges was unspecified — and President Obama showing up in his shirt sleeves? On Thursday I also saw a video from Worldnet Daily, which proposed that the oil spill is God’s punishment on America, because our government has turned against Israel. I checked my Jewish calendar, to make they got Israel’s Independence Day right. Sure enough, it fell on April 19 this year, the day before the oil spill started. Coincidence? Perhaps, but we won’t know for sure until this is all over. A very similar idea came up at my church in 2005; then my pastor speculated that God let Hurricane Katrina strike America, because we put pressure on Israel to evacuate the rest of the Gaza Strip, and give it to the Palestinians. If you’ve seen any news reports from Gaza over the past five years, you know the land transfer didn’t do anything to reduce tensions in the Middle East. Just a couple of things I forgot to mention in yesterday’s piece on the NBA Draft. First, this is the first time that five players from the same college (UK) were picked in the first round of the draft. Second, one of the players, Daniel Orton, was snapped up by the Orlando Magic. Go Cats, and go Magic! Sorry I didn’t write sooner, I’ve been having computer problems since yesterday (WordPerfect wasn’t working properly, plus a few minor things). I think I got them taken care of now, but they consumed most of the free time I would use for blogging. The above title refers to a pair of milestones in my family. Yesterday marked three months since the birth of my grandchild Lexi, and tonight marks two years since my mother passed away. Of course, for this sports-preoccupied town, the main even tonight was the NBA Draft. When I lived in Orlando, the only time I remember the NBA Draft being a big deal was in 1992, when the Orlando Magic got the first pick and chose Shaquille O’Neal. This time, five University of Kentucky players were there, and this was the first time somebody from UK (John Wall) was the #1 pick. The results were that John Wall got picked by Washington (just what everybody expected), DeMarcus Cousins went to Sacramento, and Patrick Patterson went to Houston. Now that all of UK’s best players are gone, I wonder what surprise John Calipari will have for us next season? 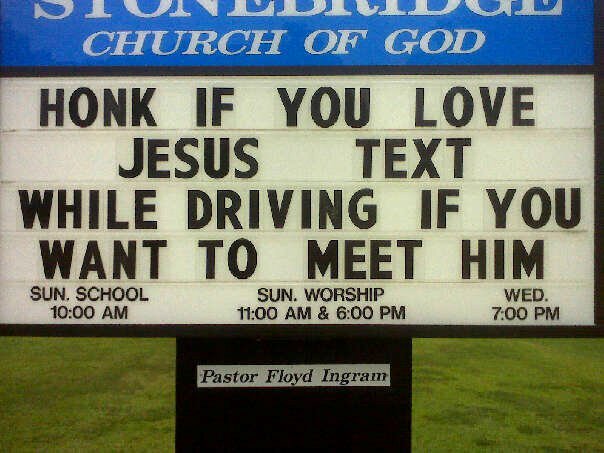 The sign in the picture below has nothing to do with the other things I’m talking about, it’s just very appropriate for these times (e.g., text-messaging while driving was recently outlawed by our state legislature). Yes, Orlando is making news again, but not in a way that makes it look good around here. First, it is the first city in the nation to name a road after the current chief executive: President Barack Obama Parkway. Never mind that he has only been in office for seventeen months, and hasn’t really done anything yet as president that will make people remember him in a positive light. No doubt he got the honor because somebody is hopeful for the future, like when he was awarded the Nobel Peace Prize. I sense the hand of Buddy Dyer in this. Is he still mayor of Orlando? He got elected shortly before I moved out of Florida, but I got the distinct impression that he’s very liberal. Maybe Alan Grayson, the Moonbat congressman elected to represent Orlando in 2008, was involved in getting the road funded and built, too. The other story involves Windermere, the suburb mentioned above. Windermere is probably the most exclusive community in Orange County. It’s not in a good location, unless you want to be near the theme parks, but the Orlando Magic and Tiger Woods are included among the people who live in its ritzy houses. Now they’ve got a mansion so big that it is being called the largest single-family home in America, and it has earned the nickname “Versailles.” it is being offered by a realtor for $75 million on an “as is” basis, because construction is not finished. I know Versailles is the name of the palace of the king of France; guess I’ll have to get used to pronouncing it “Vehr-sye” again. Here in Kentucky is a town named Versailles, which is just west of Lexington, but the locals pronounce it phonetically, so it comes out “Vrrr-sails.” In fact, if you pronounce the name correctly, the way the French do, it’s a good sign to the locals that you’re from somewhere else.